Bearing the name, top class manufacturer, supplier and exporter of Embossed Caps, we offer a wide range of Top and Side embossed caps in multiple sizes and the liner options ranges from EPE, EPE with Saranex, EPE with tin Saranex. We manufacture our products following industry guidelines, with a perfect blend of quality raw materials sourced from trustworthy vendors of the market. Backed by the vast experience of this domain, we, “Roshan Packaging Industries”, since 1984 are among the prestigious organizations engaged in manufacturing, supplying and exporting Aluminum, Perfume Closures, Bottle & Wine Bottle Caps, Metal Fuel Cans and Aluminum Containers and others. 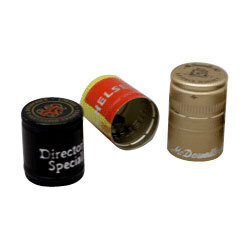 The range offered by us consists of Wine Caps, Vials Aluminum Seals, Aluminum Containers, Metal Caps, ROPP Caps, Aluminum Caps, Wine Bottle Caps, Spirit Closures, Lug Caps, Screw Caps, Perfume Metal Caps, Metalized Plastic Closures, Glass Bottles, Lug Caps, Bottle Caps, Rum Caps, Vodka Caps, Gel Chafing Fuel Cans, Aluminum Containers, Liquor Bottle Caps and many more to name. Manufactured in tandem with industry laid guidelines, these caps are offered by us in various specifications, so as to match the exact requirements of the clients. We are supported by our experienced and talented professionals in all our trade activities. All these professionals are masters of their respective working area and have proved their worth over the years time and again. Our professionals utilize their experience while completing their tasks, which results in developing qualitative and cost effective product line. Also, our professionals ensure that all these products are delivered to the customers place within the promise time-frame. Further, to simplify the process of financial transactions, we accept payments from variegated simple modes including cash, cheque and demand draft. Owing to our qualitative product range, market-leading prices, experienced professionals and ethical business dealing, we have mustered a huge client base across the markets of East Asia, North Europe, Middle East, South/West Europe and South East Asia covering Sri Lanka, Bangladesh, Egypt, Mauritius, Iraq, Syria, UAE and Africancountries.